NAD and BluOS: Redefining the Hi-Fi System | What Hi-Fi? There’s a reason people still refer to traditional hi-fi set-ups as ‘stacks’. During the ‘70s, ‘80s and ‘90s, the height of your stack was directly proportional to the power and versatility it had on tap. Each component had a single job, whether it was plucking audio from the airwaves, extracting it from disc or tape or amplifying it to enjoyable levels, and the general rule was that the more hardware you had in your stack, the better. Fair enough, too. The single-feature focus of each component meant that it could dedicate all its efforts to simply sounding great. Sure, its sonic capability came at the expense of smallness – you’d have to dedicate a big chunk of your room to your hi-fi, and a decent chunk of your electricity bill to boot – but if you got brilliant performance out of it, it was worth it. Times have changed. Now, we want our rooms to look unfussy and uncluttered. We often need to squeeze everything in to smaller spaces. But the good news is, we can do just that – and have better sound quality and more versatility at the same time. How? By adding 21st-century software to real hi-fi hardware. 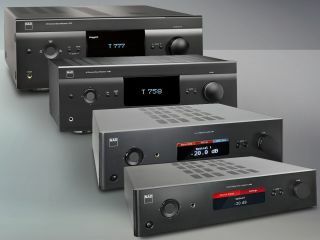 Thanks to the processing power and connectivity built into certain components from NAD’s range, and the upgradability of others, it’s now possible to have them run BluOS software that transforms these single boxes into complete wireless, multi-room, hi-res audio-optimised music systems that sound better than ever. In conjunction with NAD’s hardware, BluOS is gradually redefining the very meaning of ‘hi-fi system’. First introduced by NAD’s sister company Bluesound, BluOS is custom software with a slick user interface, and it’s the core of NAD’s wireless streaming systems. BluOS was specifically developed to deliver hi-res music streaming in a multi-room ecosystem, and is rapidly becoming the standard-bearer for high quality networked music systems. Putting the might of BluOS software behind NAD’s decades of hi-fi heritage is a no-brainer. That’s why NAD’s Masters Series M32, and the latest T 777 and T 758 AV receivers will have it baked in, while the Classic Series C 368 and C 388 can be souped-up with the optional BluOS MDC module. Take off a rear panel, slot it in and off you go – smart home audio is available instantly thanks to NAD’s future-proof modular designs. It means you can network your NAD products with each other, and with any other BluOS-enabled device, over your home Wi-Fi network. You can use them to build a wireless multi-room system; stream to them from Bluetooth devices or network-connected drives; access online services including Tidal, Spotify, Qobuz and TuneIn Radio; even weave them into popular smart-home systems from the likes of Crestron, Control4 and RTI. And, all the while, you’ll retain that signature NAD quality – just with more features. You can still make the most of a top-drawer vinyl pressing, of course, but now you can add 24-bit/192kHz hi-res file support, MQA compatibility and all popular lossless and lossy codecs. With BluOS, NAD’s components become controllable from the palm of your hand – or from your desktop if you prefer. The free BluOS Controller app is available for iOS, Android, Kindle, Windows and Mac OS X – and gives you domain over your streaming services, connected BluOS multi-room devices (including the PULSE SOUNDBAR and PULSE SUB), and more. NAD isn’t about adding capability through stacking up boxes. It’s about making its already impressive components cleverer, and better. It isn’t about following old-school hi-fi dogma; it’s about evolving with the demands of the day, and how you listen to music right now.